Weight Management Proteins (Soy Protein Isolate, rBGH-Free Whey Protein Concentrate, L-Leucine), Vitality & Energy Blend [Polydextrose, Tricalcium Phosphate, Magnesium Oxide, Sodium Ascorbate, Niacinamide, Ferric Orthophosphate, Zinc Gluconate, Calcium Pantothenate, Ascorbic Acid, Vitamin A Palmitate, Pyridoxine Hydrochloride, Manganese Gluconate, Thiamin Mononitrate, Riboflavin, Ergocalciferol, Folic Acid, Biotin, Potassium Iodide, Chromium Chloride, Phytonadione, Alpha Tocopherol Acetate, Mixed Tocopherols, Cyanocobalamin), Conjugated Linoleic Acid (CLA), Probiotics (Lactobacillus Acidophilus, B. Longum, L. Plantarum)], Alkalized Cocoa, Natural and Artificial Chocolate Flavor, Soy Lecithin, Dried Cream Extract, Cellulose Gum, Vanillin, Sucralose. Combine 2 scoops with 6 to 8 oz of cold water or unsweetened almond milk and mix thoroughly. This product is packed by weight and not volume. Some settling may have occured during transportation. Keep out of direct sunlightand store in a cool, dark place. 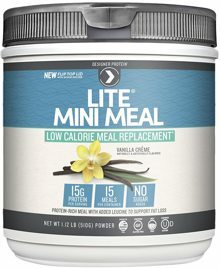 Weight Management Proteins (Soy Protein Isolate, rBGH-Free Whey Protein Concentrate, L-Leucine), Vitality & Energy Blend [Polydextrose, Tricalcium Phosphate, Magnesium Oxide, Sodium Ascorbate, Niacinamide, Ferric Orthophosphate, Zinc Gluconate, Calcium Pantothenate, Ascorbic Acid, Vitamin A Palmitate, Pyridoxine Hydrochloride, Manganese Gluconate, Thiamin Mononitrate, Riboflavin, Ergocalciferol, Folic Acid, Biotin, Potassium Iodide, Chromium Chloride, Phytonadione, Alpha Tocopherol Acetate, Mixed Tocopherols, Cyanocobalamin), Conjugated Linoleic Acid (CLA), Probiotics (Lactobacillus Acidophilus, B. Longum, L. Plantarum)], Natural and Artificial Vanilla Flavor, Soy Lecithin, Dried Cream Extract, Cellulose Gum, Vanillin, Sucralose. Designer Protein is a leader in high quality protein products that support healthy nutrition, fitness and overall well-being. Our range includes whey & plant-based proteins designed for health, strength power, and performance. 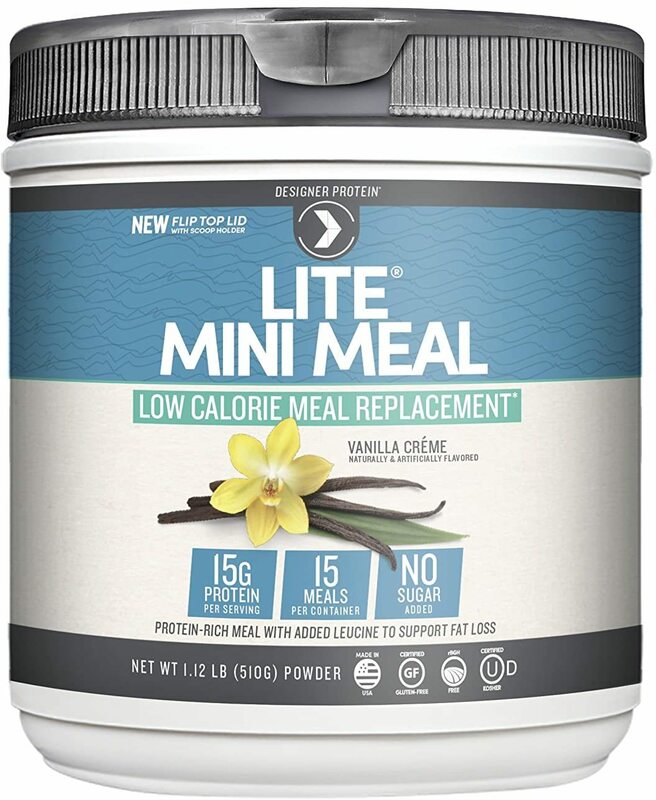 15g protein with all the amino acids to help build & maintain a lean, toned body, including added leucine to support fat loss when combined with a calorie controlled diet & regular exercise. Weight Management Proteins (Soy Protein Isolate, rBGH-Free Whey Protein Concentrate, L-Leucine), Vitality & Energy Blend [Polydextrose, Tricalcium Phosphate, Magnesium Oxide, Sodium Ascorbate, Niacinamide, Ferric Orthophosphate, Zinc Gluconate, Calcium Pantothenate, Ascorbic Acid, Vitamin A Palmitate, Pyridoxine Hydrochloride, Manganese Gluconate, Thiamin Mononitrate, Riboflavin, Ergocalciferol, Folic Acid, Biotin, Potassium Iodide, Chromium Chloride, Phytonadione, Alpha Tocopherol Acetate, Mixed Tocopherols, Cyanocobalamin), Conjugated Linoleic Acid (CLA), Probiotics (Lactobacillus Acidophilus, B. Longum, L. Plantarum)], Alkalized Cocoa,Natural and Artificial Chocolate Flavor, Soy Lecithin, Dried Cream Extract, Cellulose Gum, Vanillin, Sucralose.